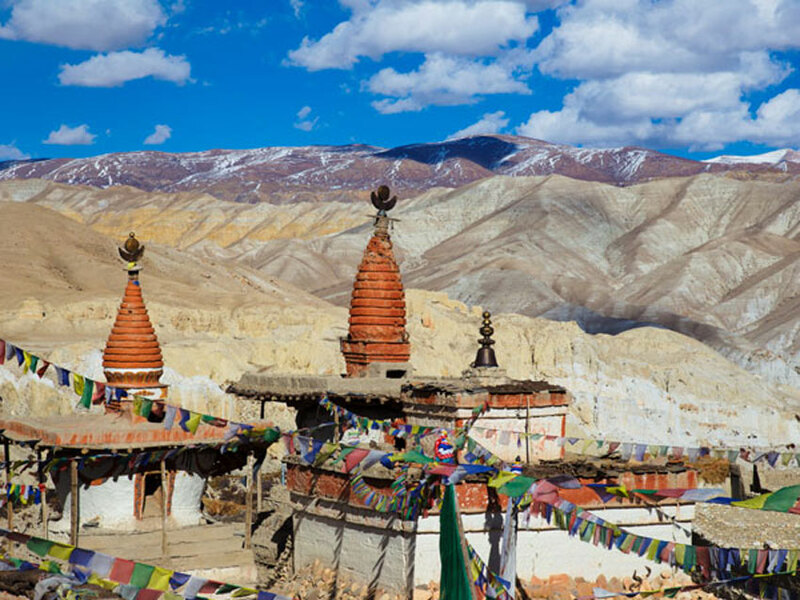 Our wonderful Upper Mustang trek starts from Jomsom after taking a scenic flight from Pokhara, leading you to the hidden Shangri-La of the ancient Buddhist kingdom of Mustang, also called Lo. 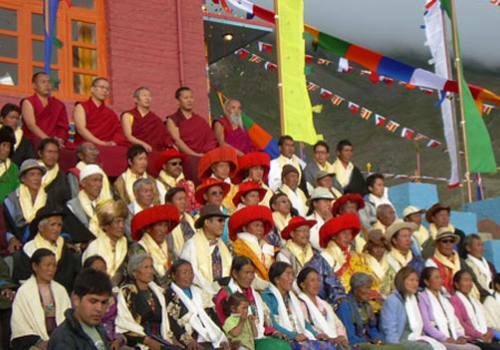 Lo used to be part of the Tibetan empire, and is therefore closely connected to Tibet. 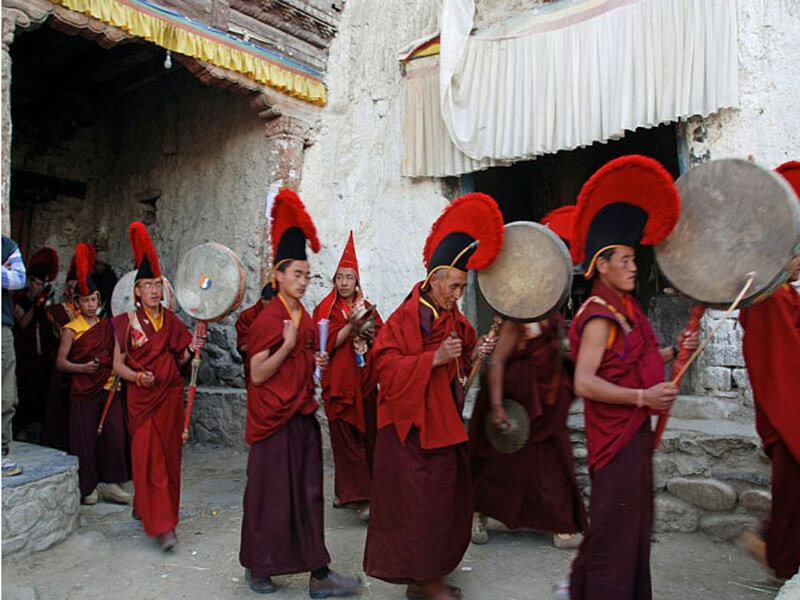 Tibetan Buddhism is still being practiced in a very pure form and villages are built in Tibetan style, with white washed houses with firewood tucked on the roofs.Until recently you could only come to Upper Mustang with a fully organized camping trek. However, nowadays some villagers have opened up small guesthouses and you can stay in a guesthouse in each overnight place. While staying there, you are welcome to sit with them in the kitchen. 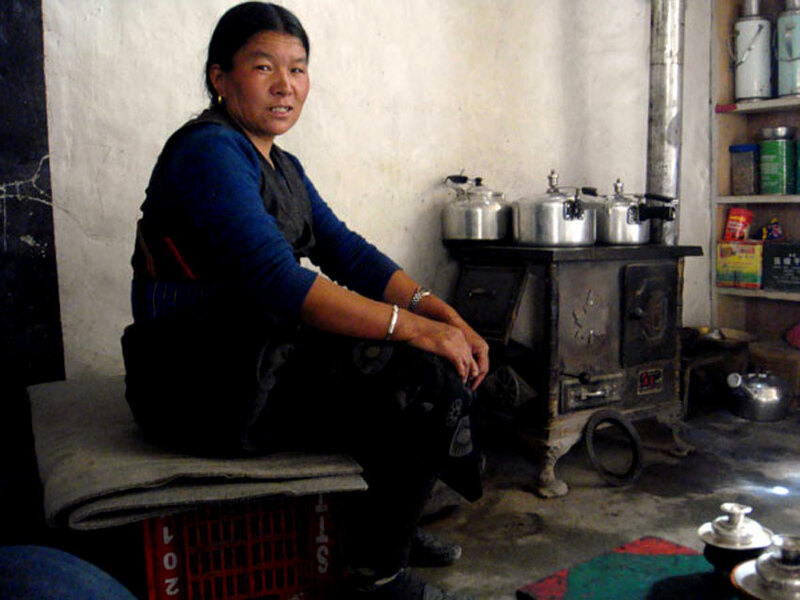 In Tibetan culture, the kitchen is the center of the house, and built like a kind of living room. So there is no better way to learn a bit about the daily life than spending time in the kitchen! 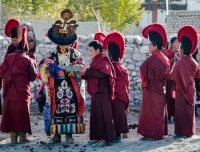 Not only the culture and tradition but also the landscape is very much related to Tibet. Mustang lies in the rain shadow of the Dhaulagiri and you walk in a complete desolate landscape, surrounded by rocks in all kind of colors and bizarre formations. 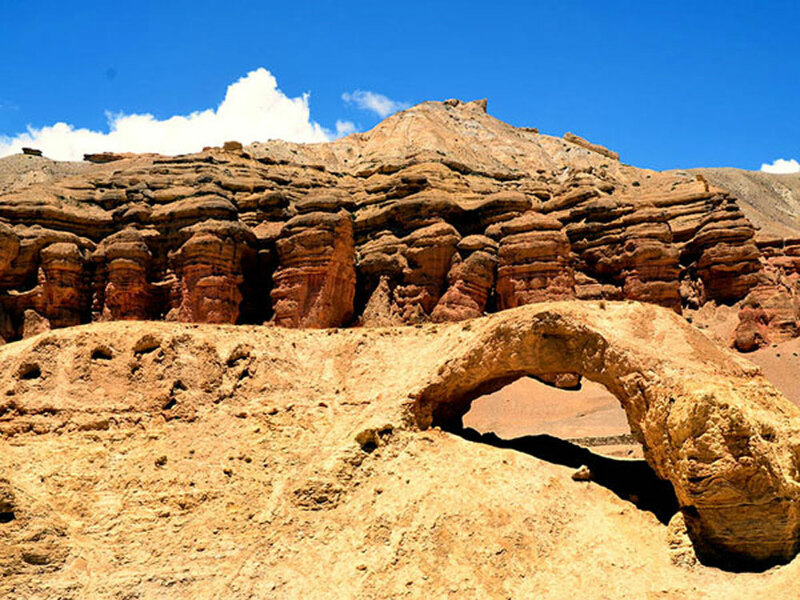 In this barren landscape the villages with their bright colored fields are like oases.The trail follows the salt caravan route of the old days, during which the people of Mustang traded Tibetan salt with grain from the lowlands. The goal of the Upper Mustang trek is the capital of Upper Mustang, LoManthang. Lo Manthang is a medieval old town, surrounded by a huge town wall. From the pass Lo La (3950 m) you can see the town shimmering in the distance in the barren landscape. Entering LoManthang through the town gate you enter a different world. It is just wonderful to wander through the narrow alleys. On several corners of the street you can find small groups of women spinning wool and discussing the news of the day. At the end of the afternoon big herds of goats are being let through the city gate and through the narrow alleys, back to their sheds, which are inside the town. In Lo Manthang you can find the palace of the king, a huge 4 story high building. When the king is at home, you can even pay him a visit sometimes. The king doesn’t have any real power anymore, but is of course still highly respected by his people. Besides, there are a few beautiful big monasteries, for example the ThugchenGompa, built in the 15th century. Or visit the amchi museum and amchi school. 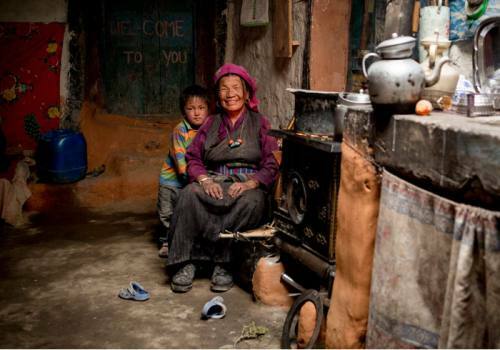 An amchi is a traditional Tibetan doctor. There are 2 amchis living in Lo Mangtang, which are also the official doctors of the king. They founded a school to preserve this ancient wisdom. Also interesting is a ride by horse to Chhoser, where you can visit a small monastery and a century old cave dwelling, situated high in the rocks. The most convenient way to get to Upper Mustang is to fly from Pokhara to Jomsom and start the trek from there. The flight is an attraction in itself, flying through the deepest gorge in the world, between the Dhaulagiri and the Nilgiri. You follow the famous Kali Gandaki River upstream, partly walking in the river bed itself, to Kagbeni. 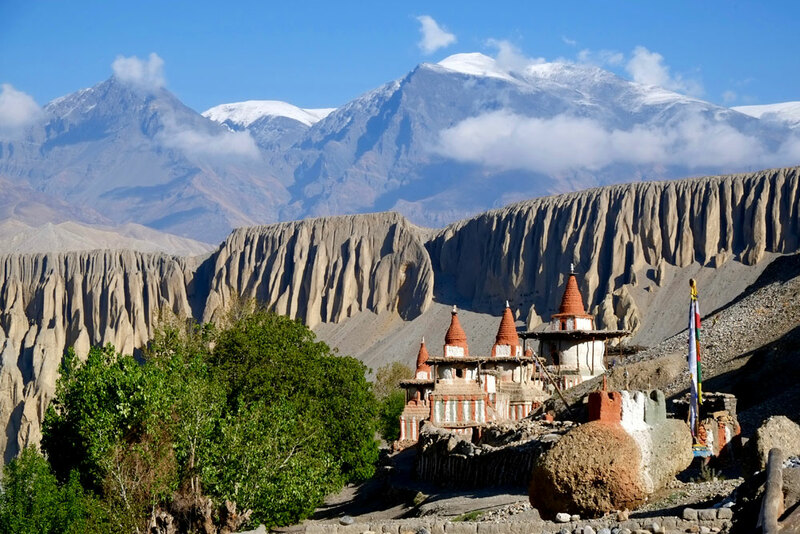 Upper Mustang Trek Itinerarywill be 10 to 14 days long depending on your time frame and interest plus you will have to add transportations days in the duration. From Kagbeni the restricted area of Upper Mustang starts. 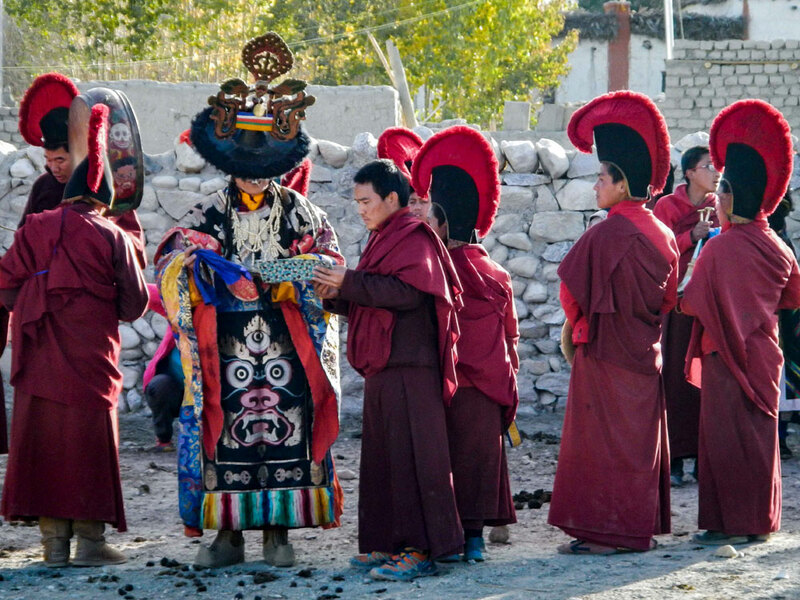 The trail goes northwards, and brings you in 4 to 6 days to Lo Manthang. You cross pass after pass, which are all between 3,500 and 4,000 m. You can return partly by a different way via Dhakmar, crossing 2 passes of around 4,200 m. Close to Dhakmar you can find the oldest Tibetan monastery in the world, the Lo Gekar Monastery. 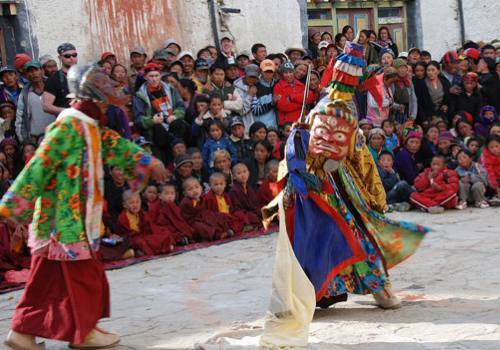 Lo Gekar Monastery was built in the 8th century by the famous Tibetan magician Guru Rinpoche. He had to kill a powerful demon first and the blood of the demon has painted the rocks around Dhakmar bright red. 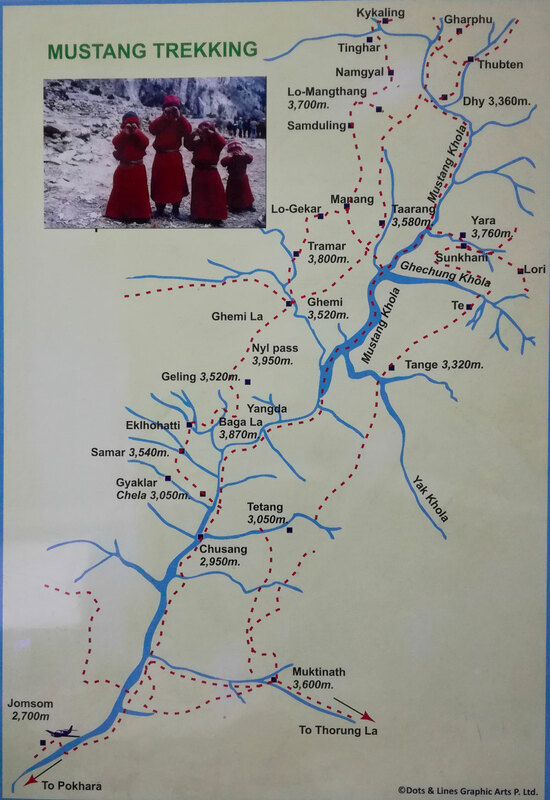 After visiting Lo Manthang there is alternative route via Yara – Tangbe - Muktinath in the west. 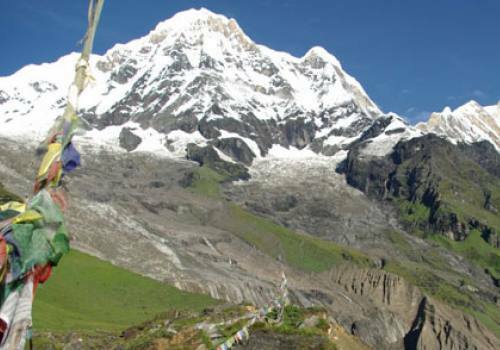 This route is much demanding but offers much better landscape view and visiting a Luri Gompa is worth. This route is also can be done as teahouse trek no camping required and good to avoid the dirt road but this route can be challenging for novice trekkers. 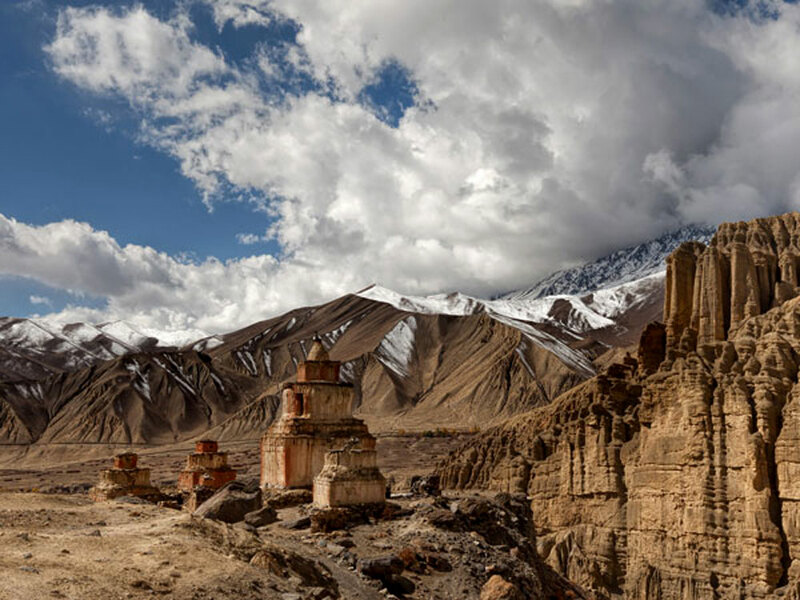 Upper Mustang has been a restricted area and was forbidden until1992 for foreign visitors to enter the kingdom. Nowadays foreigners are allowed, but to go into Upper Mustang visitor have to buy a permit of US$ 500 per person (to be arranged through a registered trekking agency and valid for 10 days, each additional day costs US$ 50). 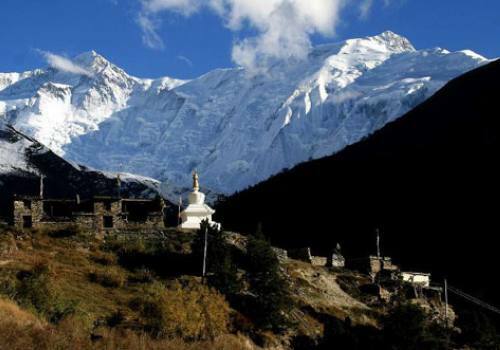 Plus you will need ACAP (Annapurna Conservation Area Project) permit which cost NPR 3000 (about USD 30) per person. Kali Gandali Valley and it’s gorge which is deepest in the world. Classic Tibetan Kagbeni village. Kagbeni is one of the beautiful villages in the word. Lo-manthang, the wall city and centuries old Tibetan Buddhsit Monasteries. Chhungsi Cave, 1200 years old Ghar Gompa, Khanpa Caves in Chhoser Valley. 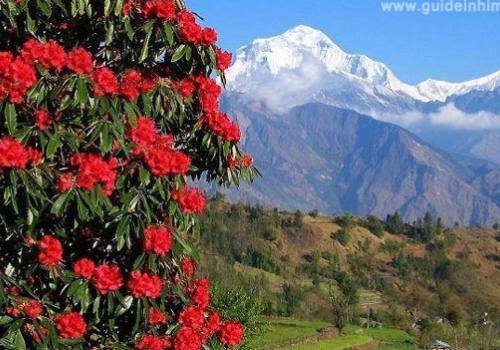 Trans Himalaya which is said to be under the rain shadow in the world. 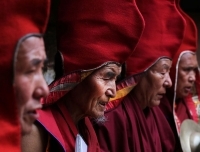 Give you the feeling and and experience that you are in Tibet. Day 01: Meet and greet in Kathmandu. Today; we meet in Kathmandu. A short briefing about the trip. Accommodation and meals on your. We can arrange if you ask us to help you. Airport pick up can be arranged if you want us to pick you. Overnight in Kathmandu. Day 02:Get permits, trip preparation. Today, we will get your upper mustang trekking permits. You could do trekking preparation or you have choice to visit ancient old temples in Kathmandu. In the evening; Wilderness Excursion's manager will introduce your guide and final brief about your trip for next day departure. overnight in Kathmandu. Accommodation on your own. Day 03: Fly to Pokhara. 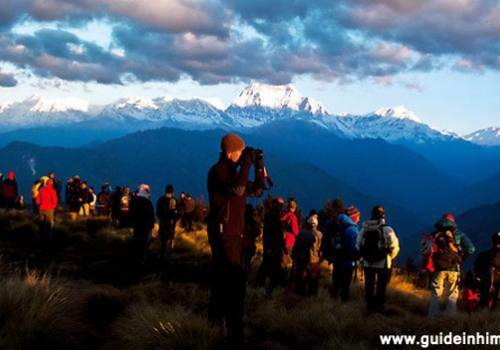 Pokhara sightseeing or rest and relax in Pokhara. 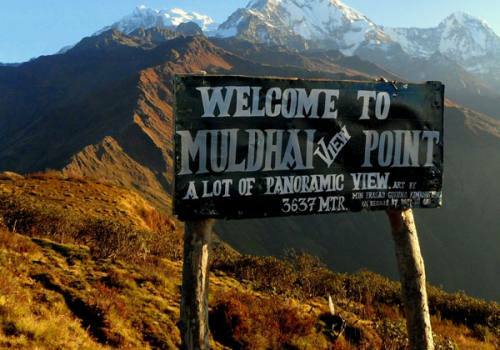 Shuttle from your hotel in Kathmandu and take a flight to Pokhara. Your guide will accompany you from this day. You have choice to relax in Pokhara or have a sightseeing or walk around beautiful Phewa Lake. Overnight in Pokhara. Accommodation included today in Pokhara. Day 04:Fly to Jomsom (8921ft. 2720m) and trek to Kagbeni (9216ft. 2810m). 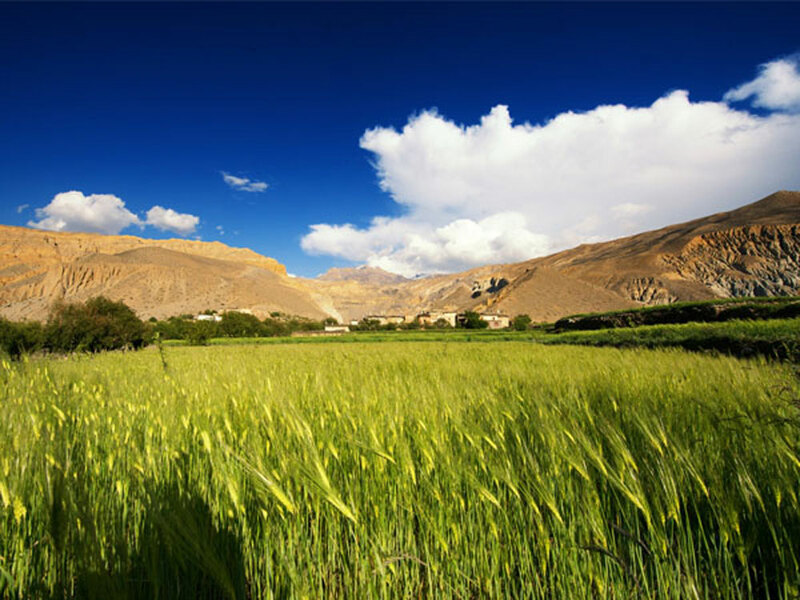 Today we will take an early morning flight to Jomsom which is famous for its apples, strong winds and the landscape. We begin our trek on an open trail alongside a beautiful valley. 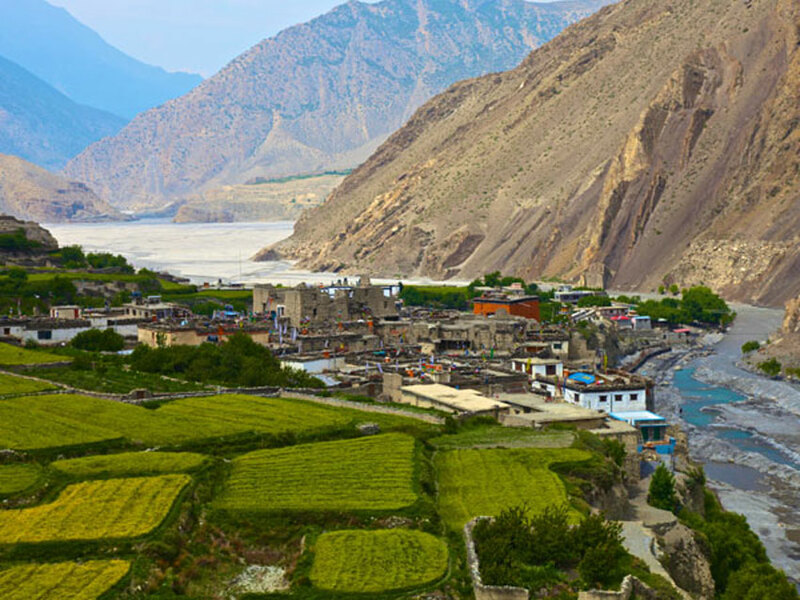 We pass through Eaklibatti village after Jomsom which is ideally located at the bank of two rivers. The village is beautiful with flat-roofed houses and also has ruins of an old fortress. Overnight in Kagbeni. Day 05:Trek to Chele (10004ft. 3050m) via Tangbe/Chhusang for lunch. Day 06:Trek to Ghilling (11709ft. 3570m). Explore monasteries and village. Day 07:Trek to Ghami (3,460m/11,352ft). Explore monasteries and village. We ascend to the Yamda La pass at 3,850m. On the way, we pass by a few teahouses, chortens and beautiful villages. 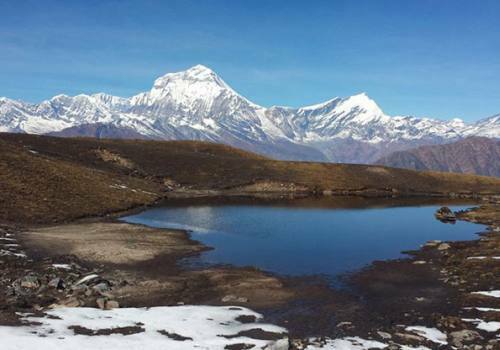 We trek through poplar forests and barley fields and reach Nyi Pass at 4,010m. From here, we descend to Ghami which is one of the biggest villages in the Lo region. The village is beautiful with fields surrounding the entire village. Overnight in Ghami. Day 08: Trek to Charanag (11677ft. 3560m). Explore monasteries and village. Day 09:Trek to Lo Manthang (12,238ft. 3,730m). Visit monasteries, king´s palace and museum. Day 10: Excursion Choser village, back to Lo Manthang after vising monasteries and caves. We start our trek early to avoid strong winds and descend for the most part of the trek. Our trail passes through a dry plateau and fields before reaching Syangmochen. 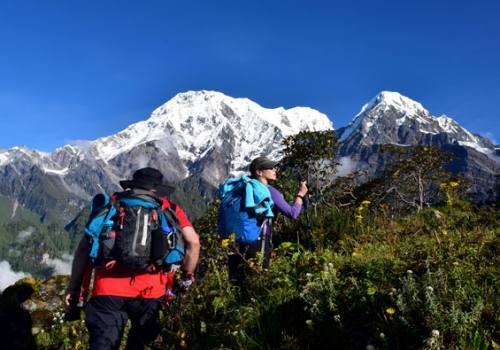 The walk can be relatively difficult as we are most likely to experience strong winds on our face, but we still get good views of Dhaulagiri and Nilgiri mountains. We can tour the village around the evening. Overnight in Yangmochen. We begin our trek after breakfast. We walk on the same trail as before going up to Lo Manthang. On the way to Chhuksang we can enjoy great views of the Himalayas and small villages we pass en route. Overnight in Chhuksang. Government certified English speaking friendly local guide. An assistant guide if the number of participants are above 6 people. 1 Sharing porter for two trekkers during the trek (weight limit 25kg). 2 Nights deluxe room in 2** hotel in Pokhara with buffet breakfast. 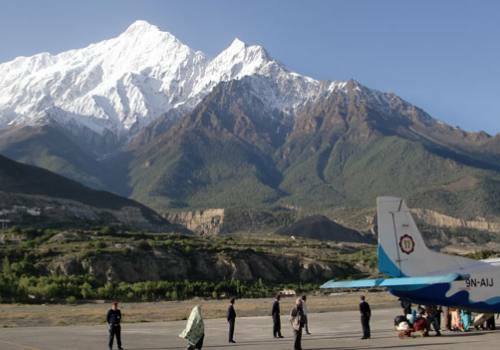 Pokhara – Jomsom - Pokhara round flight worth of USD 250.00 per person. 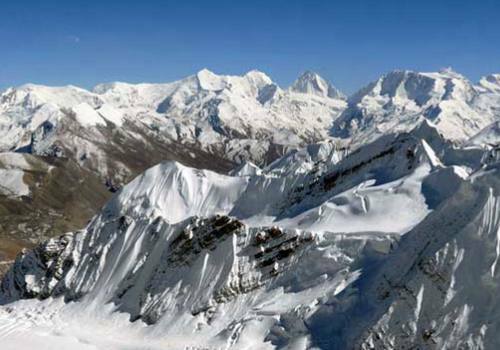 Pokhara – Jomsom - Pokhara round flight of your guide. Pokhara - Kathmandu by A/C tourist coach. 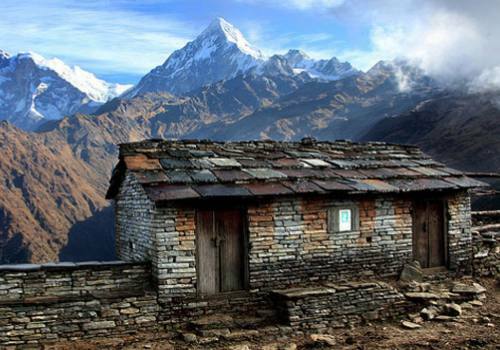 Trekking lodge accommodation on twin bed sharing basis during the trek. All meals: breakfast, lunch and dinner during the trekking. 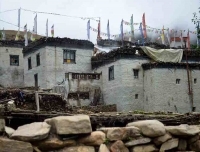 All necessary upper Mustang trekking permits. Salary, insurance, meals and accommodation of your guide and porters. Transfers, accommodation, meals and sightseeing in Kathmandu. Bar bills, beverages like coke, fanta, sprite, mineral water, can juice etc. Expenses of extra adventure, donations in monasteries (your choice). We as a couple did this wonderful camping trek in April/May 2016. Everything was perfectly prepared. Pradip and his crew (guide, cook, porters) were awesome. They did everything to make it comfortable. They always had a plan b if there was an issue. 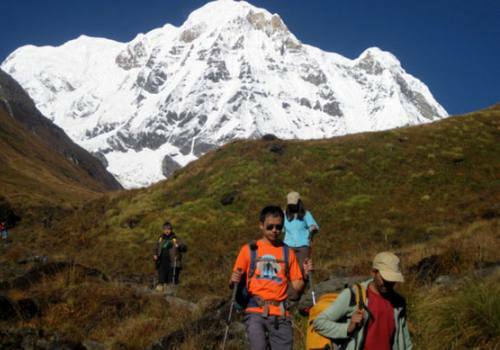 We can strongly recommend him to organize all kind of treks and we will hire him again next time we come to Nepal. This trek started in Jomsom. After driving from Kathmandu to Pokhora we had a short flight to Jomsom. After 5 walking days we arrived at Lo Manthang. From there we continued to Yara and further to the Teri La Pass. After the pass we were hiking down the Nar Phu Valley to Nar. This region before and after the pass is very remote and we did not see anybody for a week. From Nar we went to Koto, Meta and finally we arrived at Dharpani. From there we had a Jeep to Besi Sahar. The trek including rest days in Kathmandu was almost four weeks. We can recommend this trek to people who like to be in a remote area without lots of tourists. But you have to be prepared for some long days with max. ascent up to 1600m. It was a great experience and a pleasure to be with this professional and friendly crew! We had a great trip to Upper Mustang. Mustang is incredible, the landscapes are otherworldly. Our guide and porter were both incredibly helpful and sorted out all of our admin, meals and look after our every need - we never had to worry about anything. The only improvement is our guides english was limited and he was not very familiar with back trials and the history of the area (although we are irritatingly curious). I would strongly recommend getting a paper guide to Mustang to support the tri, but everything else is covered by the Wilderness Excursion team. Thanks Guys! Tom and Kate. 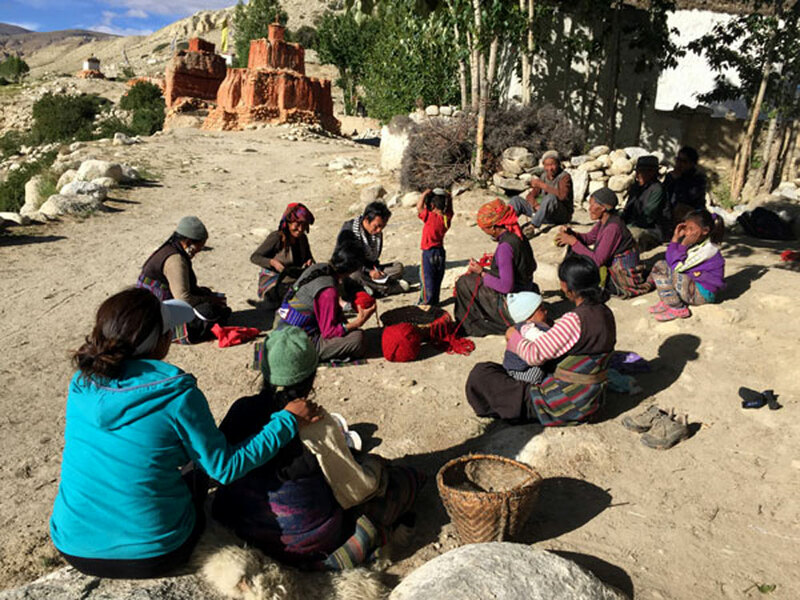 Trip Note: - Trek to Upper Mustang Permit Costs USD 500 .00 per person for first 10 days then USD 50.00 each extra day per person and ACAP Permit is necessary that cost NPR. 2000.00 Per person. No TIMS Card is required for this trek. 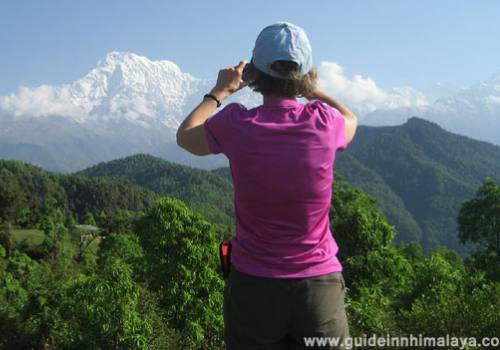 Your trek must be organized with Nepal Government authorized local trekking agency in Nepal. A licensed Nepalese trekking guide mandatory to accompany you and there must be minimum two parties to get the Upper Mustang Trek Permit. Wilderness Excursion offer fixed departure and offer a join group for individuals and solo trekkers. This trip can be customized as per visitor’s need that meets your budget and time frame. The trip price will be according to Deluxe, Standard, Budget and group size so please kindly provide us your details for tailor made program. 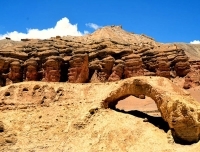 To trek through alternative Upper Mustang circuit route, w will have to camp at Paha as there is no lodges available between Tangge and Tetang. Many people take pack lunch from Tannge and begin the day early to make to Tetang in one day that may take 10 hours. Horse rent is available at Tangge. Rivers may affect the trail during monsoon time (Mid June to Mid September) and there is no bridge at Dhye and will have to take the shoes off and cross the river.